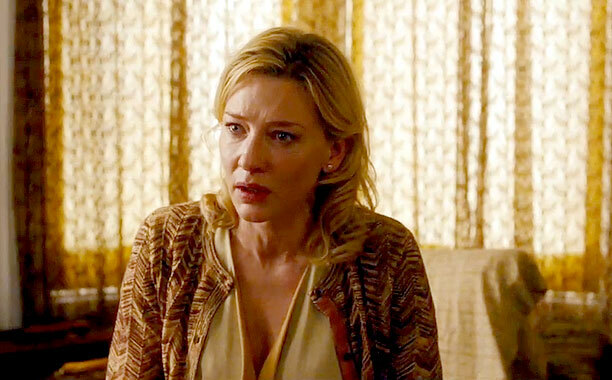 If Midnight in Paris was Woody Allen's ode to classic literature, then his latest, BLUE JASMINE, pays homage to the time-honored Tennessee Williams play, A Streetcar Named Desire, if Blanche DuBois was a Park Avenue socialite played by Cate Blanchett. And what a fine way to revere one of Williams' most adapted dramas with a modern take that thrusts its slowly malfunctioning central character into a new situation that only hastens her demise. Blanchett stars as Jasmine, a self-fabricated New York City aristocrat, who is forced to move in with her lower-class sister Ginger (Sally Hawkins) in the slums of the Bay Area in California when her husband Hal (Alec Baldwin) goes from highfalutin big shot to money-swindling convict within a moment that proves too overwhelming for Jasmine to bear. So she tries to do what any fragile, male-dependent, newly penniless damsel would--leave the messy, shattered remains of that life in a pile and go find a new one to which she can cling. But her fractured past comes back to haunt Jasmine in a series of increasingly devastating flashback scenes that are nagging reminders to her that she can't honestly move forward without acknowledging what happened. It is that psychotic neglect that Blanchett perfectly captures so sadly yet so beautifully in Jasmine's desperate attempt to remain intact when her emotional (and mental) composure withers at the seams. Blanchett walks a very thin line so as not to make Jasmine come off batty but rather a deeply despondent patient of her own making, whose only defense is to project her pain on her far more self-aware sister (someone she thinks is too dim to make anything of her life). But Ginger, and the audience, already know that much of Jasmine's character is barely made of various elements of her own life, some real, some not real--down to her name, which she handpicked as an adult after listening to the Rodgers and Hart tune, "Blue Moon." You can often hear this despairingly amorous ballad lightly playing in the background of the film. But in true Streetcar fashion, all her delusions begin to collide with one another once she moves in with Stella Kowalski Ginger, who, along with her Stanley Kowalski-type boyfriend Chili (Bobby Cannavale) expose Jasmine for who she really is, in a non-malicious but matter-of-fact way. 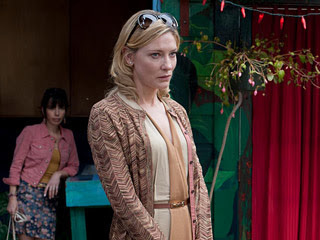 While Blanchett's performance wonderfully portrays the contradictions of a complex character (even always seeming on the verge of tears without actually crying), Hawkins' Ginger is an astounding depiction of a woman who grapples with becoming a two-character composite of who she knows she is and who Jasmine says she should be. In one of his most painfully neurotic portraits of his career, Allen still manages to romanticize the story, using Jasmine's coveted memories to cushion her otherwise agonizing downfall, while juxtaposing it with Ginger's imperfect yet dependable romance that turns out to be worth fighting for. 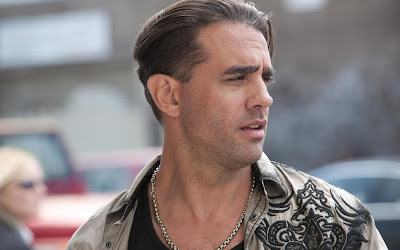 Throughout the film, there's even a Meanwhile, Cannavale's Chili is a surprisingly soft-hearted yet rugged gentleman who doesn't bother to tip toe around Jasmine's delicate feelings. While his rather brute approach further dampens Jasmine's feelings toward him, his authenticity and loyalty (two things Jasmine has never given Ginger) is ultimately what solidifies his and Ginger's relationship. An inspired re-imagining of Williams' already brilliant piece, BLUE JASMINE is marked by staggering performances (including Andrew Dice Clay as Ginger's jilted ex-husband) and a fine-tuned script that punctuates the ailing romances we sometimes have with ourselves and each other. Never been the biggest Woody Allen fan but this sounds amazing! I saw a sneak preview of this film and Cate Blanchett's performance was stunning, stunning, stunning! Just mesmerizing!